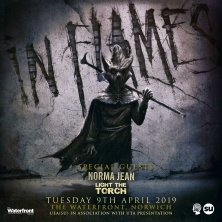 In Flames is a Swedish heavy metal band, which was formed by guitarist Jesper Strömblad in 1990 in Gothenburg, Sweden. Along with At the Gates and Dark Tranquillity, [artistlink slug="in-flames"]In Flames[/artistlink] is responsible for developing the genres known as Swedish death metal and melodic death metal. Page generated in 0,151960 seconds.